When it rains, it pours, and it's a tornado right now for Ben Roethlisberger. In his latest hit, he's being dropped by PLB Sports, the manufacturer of Big Ben Beef Jerky, Flutie Flakes, and a number of the other sports-related food products you see on grocery store shelves. PLB ended their deal with Roethlisberger based on a morality clause in his contract, and noted that all production will cease and the remaining product will be destroyed. Company president Ty Ballou added, "I hope he can learn from this." If Roethlisberger can't learn after all this, I'm afraid he's never going to get the message. is nike a sponsor of benny's? Good for PLB Sports. Because when I eat my beef jerky, it damn well better be made by a company that enforces its morality clause. 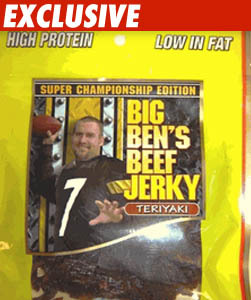 "Roethlisberger looses Beef Jerky Sponsor; Focuses on Hot Beef Injections"
I think PBL Sports missed an opportunity here. They should have just repackaged and unveiled a new marketing plan. How 'bout "Bens a Big Jerk" tasty meat-like product.